Home News & Offers News Children in Need come to Padstow! Children in Need come to Padstow! We were delighted to welcome Children in Need to Padstow as part of The Rickshaw Challenge. Now in it’s fifth year, a new team of 6 riders took on the 470 mile challenge from Land’s End to the East End joined by The One Show’s Matt Baker, arriving in Padstow on the evening of Friday 6th November. 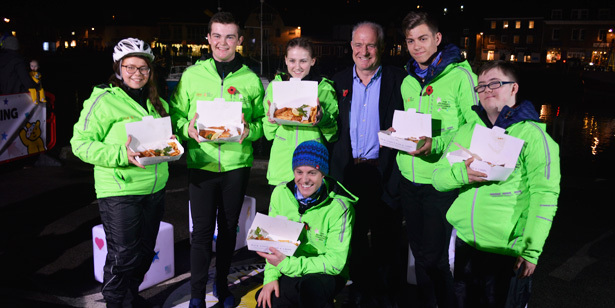 Rick joined The One Show who will filmed live from Padstow on Friday to support the challenge and our team at Stein’s Fish and Chips were on hand to offer the riders a well earned portion of fish and chips when they arrived! To find out more about The Rickshaw Challenge and to donate, click here. To see more photos of the evening, take a look at our Facebook album.